Peter Beard. Various e-mail below documented from The Keep, Sussex, England. The coat of arms on this page is for a Scots family NOT Nicholas. 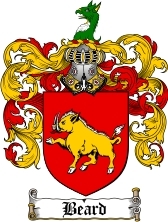 The coat of arms for Nicholas and Pedigree for this Sussex England family is well documented. Daniel married Susanna Scrace 4th October 1710 at Preston (Brighton ), Sussex. Nathaniel married Mary Weller on the 8th of March 1757 at Staplehurst, Kent. Susannah was born the 3rd of December 1759. She married Ambrose Austen on the 18th of November 1779. Nathaniel’s notebook detailing all his children’s births (hour minute and day) is held at East Sussex Record Office. The only printed Coat of Arms are in the Victoria History of Sussex, but I forget which volume. I will chase it up. a saltier Or charged with five fleur-de-lis Gu. tufted, maned, and armed sable. Thomas’ will (1627/8), Richard’s will (1647/8), and Nicholas’ will (1702). Hello, My name is Norman Cousino II, and I own an original copy of the Life of Thomas Beard, printed, in 1734, by William Cooper.I am trying to sell it. I bought it in Northfield, Massachusetts, in the 70’s from a Revolutionary soldier’s house. My phone # is (413) 773-7555. I will not get email so please call direct. I am also contacting your state’s historical society. It is a rare item. Your family gets the first say. Thank you.